Amanda is dedicated to the healing arts and to reconnecting people with the instinctual wisdom of the natural world using ancient traditions, animals, and nature. 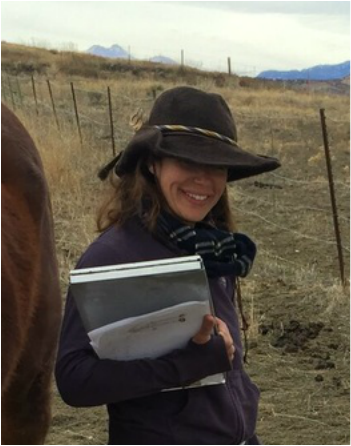 She works with her herd to support children, youth, and adults in cultivating body-centered awareness, accessing somatic information, using a series of exercises in her programs, designed to facilitate and teach participants to access and work with their emotions, and reconnect with their body’s innate wisdom. Amanda holds a Master's in Eastern Studies from St John's College, Santa Fe, NM. She weaves ancient teachings and her yoga training (with Richard Freeman, Dena Kingsberg, Tias Little) in her nature connect programs & EFL sessions– reconnecting participants to archetypes, animal totems, and esoteric wisdom. ​Horsense EFL programs are individually designed to cultivate somatic experiencing and horse-sense perspectives. In working with horses and learning from horses and nature, we develop what Christian de Quincey calls “…clear reason rooted in the feelings of the body and open to transcendental shafts of wisdom…” and have unusual opportunities to revisit, move through, integrate and shift lingering patterns, and envision our future. In working with horses and learning from horses and nature, we develop what Christian de Quincey calls “…clear reason rooted in the feelings of the body and open to transcendental shafts of wisdom..."